Back again with another Lawn Fawn Inspiration week post! Today we are sharing cards made with the new Lawn Fawndamentals Note cards. These are 4 bar size, top folding cards and come in 5 fun polka dot colors. I created a whole card set using the Let's Polka papers and Hello Sunshine stamp set. The circle and scalloped circle stackable make it easy to whip up a quick set of cards like this that would make a very nice gift! Be sure to check out the Lawn Fawn Blog for more projects with these notecards and giveaways! 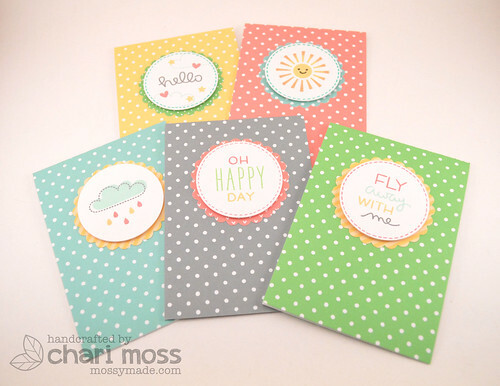 Super cute notecard set, Chari! Love that they are so simple yet so darn adorable!!!! love all the fun inks colors. nice to see them matched up to the notecard colors. Totally cute!! I love this idea. I so need this paper! !